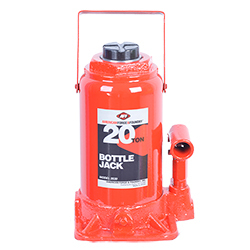 AFF Bottle Jacks are built �Forge-tough� in a wide selection of capacities for automotive, marine, construction, industrial and agricultural applications where the ability to lift, push, spread, bend, press and straighten either horizontally or vertically are essential. All have centered pumps and rams with heat-treated pistons for balance and easy positioning. Their saddles are made of machine hardened steel. All models with capacities of 8 tons or higher have convenient carrying handles while model 3506C comes in a rugged plastic carrying case.